I just bought a HAF-X case. Going to do a review of it (even though there are like a billion out there already). Looks like I wll have to start making my images smaller so they will be able to upload to this server (my last review kinda sucked because the pics were VERY large, and also they wont show the whole pic when uploaded to file share). So, any ideas on making my pics smaller in size without losing much detail? Taking the pic (12mb camera). Cutting out what I dont want. Using Photoshop cut-rate-version to white out everything but what I want. It seems that when I do the white-out thing, that is actually adding another layer? And since I just save it, it is usually bigger than the actual pic was. I have to bond the layers or something, then save? Anyway, I think the limit is something ridiculous like 80kb per jpg. Any thoughts on how to get a 1-2mb file down to <90kb ? Every day I try to follow Gods will. Every day, I struggle immensely with my human nature. Yeah, thats what I do. Then, I white out everything that ISNT what I want to show (so it looks like a completely white background). This seems to add another layer, and make it just as big as the original pic though. Saving it at lower res makes it smaller, but also makes it all grainy looking too. Have you tried flattening the image after creating the white out layer? This should merge all layers together...at least I think (been a little while since I fooled around). Personally, what I do for photos is to set the aperture as larger as you can and let the camera set the shutter speed. What this does is shorten the depth of field so that hopefully only what you are shooting is in focus. The rest is blurry. I also use a background like a sheet (velvet works well). So there is nothing in the background to worry about. Now the fun part...html coding. I use the thumb nail image in the article and link it to the full size image and code it so the full size image opens in a new window (rather than take the reader away from the article). I am sure there is more coding that can be used so that the full size image fits whatever window size the reader is using but I haven't gotten that far yet. Because of the way the forum is set up the image should open in a new window already (default setting of the forum). SO you don't have to worry about it if the review is built in a thread. No, thats what my buddy told me to do also, was flatten the image. Thats why I said it was bigger than the original, because I didnt know to flatten it. But, even that wont bring it down to size enough to upload the image to the server. I will try resizing next. 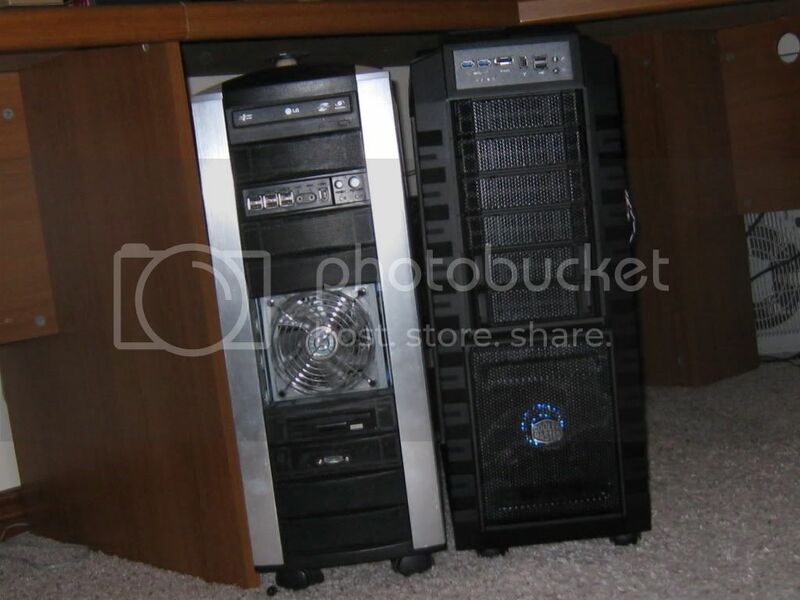 HAF-X next to Stacker STC-T01 (the STC has both upper AND lower psu bays). Last edited by Dave3d; 10-21-2010 at 09:46 PM. Same links (for full size) as in my review, but the forum shows it perfect, and the review cuts the pic in half. Your going to be up against it starting with 12 megapixel shots, but Faststone Image Viewer has some easy to use features for reducing pic size. Is it too far down the track to turn down the resolution & retake the shots? Well, 82 pics so far of the CM case. So, yeah, kinda too late. Will check out Fsatstone Image Viewer though. For the review pics, I could always submit thumbnail links, IF I could edit the review, which I cant seem to do. You almost had it! The linked url dumps you to photobucket rather than to the image alone. So the thumb above is linked strictly to the image (without the pb junk). Another trick I have used is to edit the photo in PS then open the file in a simple editer like Paint and resave the pic. Usually I find that the file size is reduced. One more tick but this time in PS (just remembered). When you go to save the PS edited image as a JPG file, it should let you choose the amount of image compression. As you choose how much compression it shows you the resulting file size. Yeah, I actually know about this one. Which, is why I no longer do that. Does this still happen even if you do not compress all the way? You can always change the setting on your camera to shoot a smaller sized pic. You do not need a 12 MB high rez pic. Even 2 MB should be pretty good.